Abbie Caplin was born and raised in Corrales, New Mexico when it was still a small, sleepy farming community. She has always been an entrepreneur, a visionary and a traveler. Realizing at any early age, that “Pretending to be a Normal Person is Exhausting” to coin a phrase from Suzy Toronto, she chose her own course of entrepreneurship; Horsewoman, Retail Enthusiast, Restaurant Owner, Earring and Handbag Designer – creating several small and manageable businesses, bringing them to fruition and then selling them to create the next one. 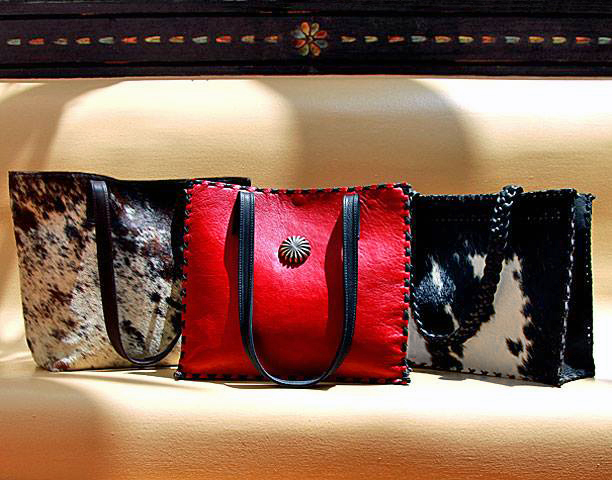 Abbie is connected to her designs in leather, cowhides and adornments. When the hair stands up on her arms, she knows it is just the right item and that this combination will lend itself to a bag that will make a statement all by itself. In collaboration with craftsman Miguel Montano, Abbie has created a stand-alone look and style that can cross many borders. She is consistently striving to create the best, most functional designer handbag ever. TT: What do you think a woman is looking for in a Tom Taylor bag? CAPLIN: Anything we do as artisans or designers is about creating value for our buyers. When you spend your time, energy and money on a purchase you want it to be special and you want passers by to stop you on the street and say, “What a great bag!” When you purchase a bag handmade by an individual artisan, you know that it is really special. It’s not a matter of need but more the pride that comes from carrying a piece created by a particular designer or craftsman. Tom Taylor bags have been painstakingly crafted over hours and hours. 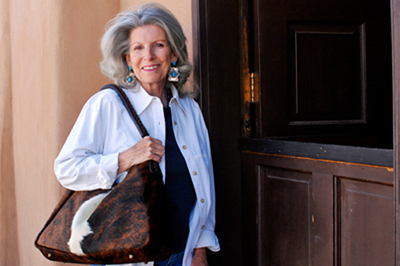 When a woman purchases a Tom Taylor bag I think that she is looking for something that is truly unique. TT: How do you begin designing a bag? CAPLIN: It’s starts with an idea or vision, then we go about creating a pattern. After that we have to find the right material, and then we put our blood, sweat and tears in to the actual creation. Even after we’ve put the bag together there are sometimes alterations that need to be made before it is ready to go on the shelves. TT: About how long does it take to make a designer bag? CAPLIN: From start to finish a larger designer bag might take from 8 hours to months to complete. TT: What are some of the details of your bags that set them apart from others? CAPLIN: For one thing, all of the bags are lined with pig suede because it is easy to clean and durable due to the cross fibers. When a designer bag is laced by hand, each hole is measured and punched individually. Not by machine. Also, the braided straps on the Abbie Caplin bags go through 6 steps before reaching completion. TT: What is your biggest motivation in designing bags for women? CAPLIN: The pure joy and satisfaction of a job well done. The love of leather and hides and being able to construct items of beauty and usefulness…or we could say – being able to construct pieces of art that are beautiful and useful. The smell of the leather and seeing a finished work of art gives me goose bumps. *All of our Handbags are unique One-of-a-Kind, and therefore, the Style photos are for Reference. We can get close, but not exact; especially with the hair on cowhide patterns.